We occasionally receive calls from business owners telling us that their Google reviews are not showing up. Most of these calls are from businesses that are not using the Five Star Review System to generate Google reviews, but found us on the Internet. This is usually a temporary issue and seems to correspond to times when Google makes updates to their own system. Reviews generally show up within a few days. Google typically shows reviews immediately. Why Aren’t My Google Reviews Showing Up? Don’t assume that when a customer goes to Google from the system that they actually wrote a review. The system shows you what review site link they clicked on, but it can’t tell you if they actually wrote a review or not. If you don’t see a review, the most likely scenario was that your customer didn’t have a Google account and was immediately confronted with a request to set one up. Most non-Google users stop right there, not because creating a Google account is hard to do, because it’s not. They don’t create a Google account because they don’t want to provide Google with their date of birth, gender and other information that is required to create an account. The single biggest reason you will not see a review on Google is because your customer never wrote it. If you’re seeing a lot of people going to Google from the system and very few reviews showing up, it’s generally an indication that someone in your office is asking customers to write reviews on Google specifically, rather than allowing them to choose the review site from your list. You can stop this by not trying to direct people to any one specific site. Your Customer Used Bad Spelling, Grammar, Punctuation, Content, etc. Google filters a small percentage of reviews based on things like grammar, spelling, punctuation, etc. If you want to learn more about this, please read my article entitled Another Reason Google Filters Reviews. I’ll show you why Google filtered three of my reviews and what I had to do to get them to show up publicly. The only people able to see filtered reviews are the Google users who wrote them. Google does not show the business owner filtered reviews. If you’re completely persuaded that your customer wrote a review and you can’t see it, you can ask your customer to go to their personal Google Plus account (where they will be able to see their review if they actually wrote it) and make the necessary content changes to their review so that Google will release if for public viewing. Google has been known to delay showing a review for up to three days. An indication that a review is being delayed is text on your Google Plus page that indicates that you have 8 reviews but you only see 7 of them. Often the 8th review will show up in a few days. I have no idea why Google delays some reviews and shows other immediately. It happens, but not very often. 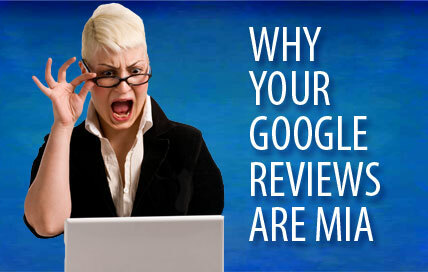 How Do You Know If A Customer Actually Wrote A Review On Google? Most of us want to believe that our customer took the time to write a review for us (because they told us they would) and we blame Google for filtering it. But that’s usually not the case. It is true that Google does filter reviews for the reasons listed above but in most cases your customer just decided that the process of leaving a review was too difficult. They provide service worthy of a 5-star review. They verbally ask their customers if they will write a review. The person with the most intimate relationship with the customer is the person who asks for the review. They make it easy for their customers to find their review websites. They provide multiple review websites to choose from and never send customers to any one particular review site. They send their review request while their customer is is with them and watching them send it. They send an Off-The-Hook Review Reminder to their customers who did not write a review. Don’t ask customers to review you on any single review site. If they’re not qualified to leave a review on the site you send them to, they’ll either not write a review or their review will get filtered. Trust your customers to review you on the sites where their reviews is most likely to show up.